This entry was posted in Golden Age of Detective Fiction, Multi-platform, Mystery, Mystery writers, Novel, October 8 Challenge, Theme. You know I’m in, Noah! (And the bingo card looks great, btw). I don’t know that I’m quite in the league with most of our GAD contributors (you included), but I’m going to do my best. Well, I do tend to run towards the L-O-N-G form essay, and you pack quite a bit into pieces that are easier to read and enjoy. Perhaps I’m just trying to steer people towards my own verbosity. But I hope you have fun with it! Thank you Noah. My reviews could probably use a bit more beefing up…this will encourage me to do so. I feel a little out of my depth having read your posts, and posts by many others who comment here, but I definitely want to contribute in some way. So I will do my best. It will be enlightening and educational and fun. Apparently I have to approve comments, Tracy, which is why this didn’t appear for a while. But the more the merrier! I’m hoping to stimulate some thinking and knowledge-sharing. Thanks for joining in! Like the dancer said in that long running Broadway show – “I can do that!” I’m in, my friend. This I will be my incentive to return to meaty essays rather than my last couple of cursory and mundane reviews. “That I can do!” Great to hear. Have some fun with it. Noah: Just completed my first square: Group of books from the 1940s. I saw that! Interesting stuff, I think you put your finger on their different attitudes towards the wartime experience. Thanks Bev! Noah: I have officially completed my challenge commitment. 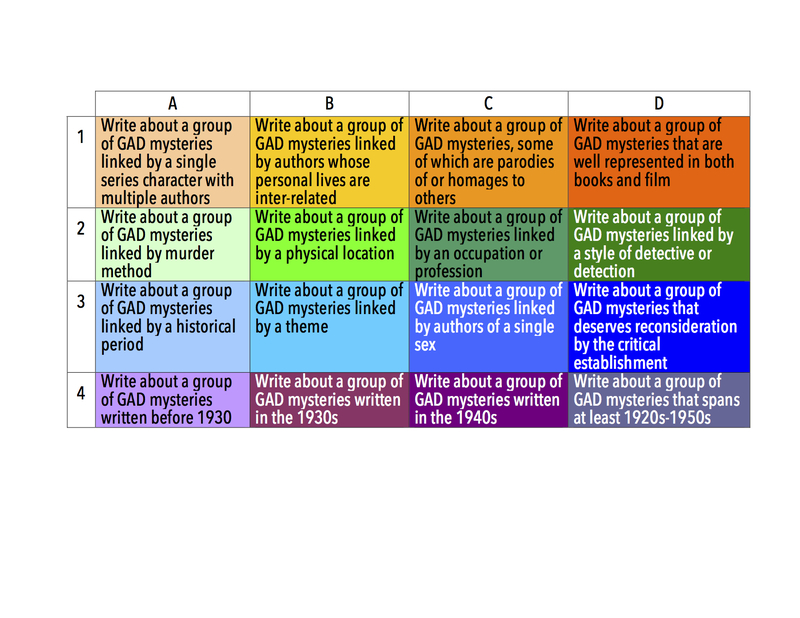 One Bingo logged with this final essay: The Detection Club. This one is actually more in your league–length-wise. 🙂 Thanks for putting this together! I’ve had a lot of fun doing the essays. Hi, I know not even a month is left for this challenge but is it still permissible to sign-up for it? I feel like getting back in the writing-mode. Do you plan to do it next year too? This challenge didn’t seem to arouse much enthusiasm in my blogging friends so I hadn’t planned to repeat it next year, but — since you ask — I’d be happy to extend the invitation for another year to give you some time to look into it. Please do write something and post about it here, and thanks for your interest! Thank you so much. Will be writing a post about it soon And hopefully next year there would be a few more participants. Perhaps Bev, whose posts got me interested, would like to repeat it too. As the challenge enters its second year, here is my signing-up post. Thanks once again for extending it for a year. I am excited about this. I did not realise that Oct. 8th is your date of birth. A very Happy Birthday. Happiness always. Thanks! It’s been quite a year! I’ll join you in wishing a happy birthday to my fellow October 8er, blogger and award-winning mystery biographer Jeffrey Marks.